Wing wizard Zach Kibirige looked to have cast the perfect spell over Exeter on his 24th birthday, only for the Chiefs to play party-poopers with a stunning second half fightback. The Newcastle Falcons flyer helped himself to a hat-trick of tries at Kingston Park, weaving his magic with some fancy footwork and a turn of speed that at times left the Devonians clutching at straws. However, his masterly on-field craft was sadly not enough in the end as last season’s Cup winners rallied defiantly to claim a share of the spoils thanks in the main to tries from Max Bodilly (2) and James Short. Looking to bounce back after their first defeat of the season at Castres the previous week, it was a much-changed Chiefs line-up that took to the artificial turf in the North East. Forwards Wilhelm Van Der Sluys and Tom Lawday were the sole survivors from that which faced the French champions in Round 2 of the Heineken Champions Cup, allowing the visitors to parade a wealth of talent keen for some much-needed game time. Among those also on duty for the Devonians was winger Olly Woodburn, who was back for his first appearance since breaking his jaw on the opening day of the season against Leicester Tigers, while young guns such as Josh Caulfield, Sam Maunder and Harvey Skinner were also given their chance to shine on the big stage. The Falcons, fresh from back-to-back European wins over RC Toulon and Montpellier, also took the turn to utilise their squad to the full in this opening fixture of the new-look competition, which this season is now minus the four Welsh regions. The early exchanges were largely restricted to a test of both side’s defensive resolve as a succession of heavyweight collisions came and went without any real impact being made. However, it was the Falcons who offered the first genuine threat when Kirbirige stepped in off the right wing, he tore through the middle at speed, but as he looked to offload to team-mate Luke Arscott, the later could not collect allowing the ball to spill loose. The Chiefs reacted quickest and in an instance they turned defence into attack, Skinner’s hacked clearace sparking a foot race towards the home try-line. Bodilly attempted to gather the ball, but under pressure he knocked on and Woodburn, who was close at hand, was denied the easy score by referee Andrew Jackson. Both sides continued to slug it out in a heavily contested midfield battle, before the visitors finally clicked into gear just past the end of the first quarter. Woodburn cleverly released Lawday down the left and although he was felled deep inside the Falcons 22, they went right at pace, then back to the left, where Woodburn’s sublime offload allowed Bodilly to dive over. 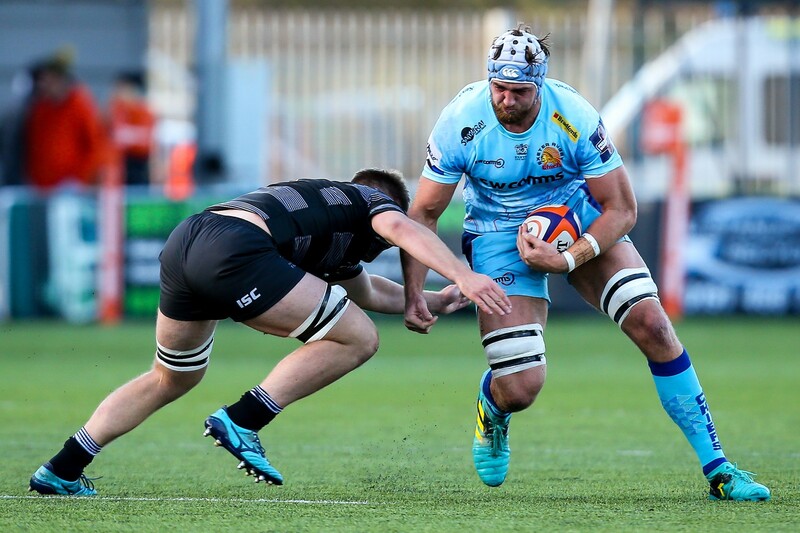 In his first Chiefs appearance since September 2017, it was a welcome highlight for the young Cornishman, who spent much of last season sidelined with injury. Harvey Skinner duly obliged with the conversion to give the visitors maximum reward for their efforts. Exeter’s lead, however, would prove short-lived as within five minutes the Falcons drew level. 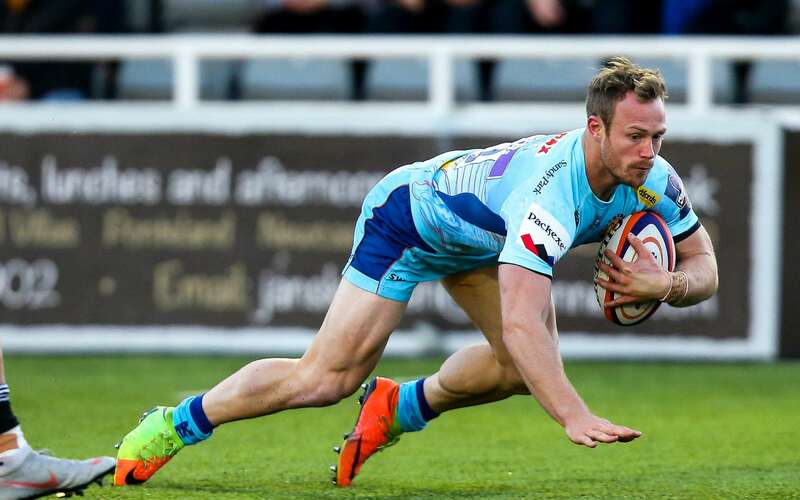 Adam Radwan’s fancy footwork saw him round Woodburn, he linked cleverly with Sam Stuart, whose simple offload allowed Kibirgie the chance to glide under the posts for the converted score. Kibirgie was causing no end of issues for Ricky Pellow’s side, who having been saved just past the half-hour mark by some last-gasp intervention from Woodburn, then fell behind just before the break when the winger was able to latch onto a clever grubber kick in behind to claim his second of the game. Newcastle fly-half Brett Connon could not convert that effort, shanking his effort wide of the target, nor could he add to their tally with a long-range penalty on the stroke of half time, his kick floating wide of the mark to leave just five points between the two sides at the turn. On the resumption, it was the Falcons who were quickest out of the traps, Sam Stuart denied in their first meaningful attack of the half by the intervention of an observant Tom O’Flaherty. It was all Newcastle during the early exchanges, their forceful work at the breakdown earning them a penalty on 48 minutes when Lawday was penalised for holding on almost right in front of his own posts.This time Connon made no mistake, slotting his routine kick between the sticks at the South End. Needing a response, Skinner - who has been plying his trade at Championship side Cornish Pirates this season - countered with a penalty of his own for the Chiefs, only for the lethal Kibirige to sting the visitors with his third of the afternoon. Fielding a clearance just inside his own half, Arscott took the ball to the Exeter line, before rolling the ball down his leg and grubbing a kick just behind the onrushing Chiefs defensive line. Kibirige was on the charge and as the ball popped up into his grasp, he chipped over the top before gathering in possession and racing to the line to score. The home faithful duly erupted into celebration, as did Kibirige, who was mobbed by his team-mates on a stunning solo effort. Connon’s conversion stretched the home lead to 12 points entering into the final quarter. Pellow turned to his bench for an injection of fresh impetus and it was one of those new faces, winger Short - making his first appearance since the Chiefs won the Anglo-Welsh Cup against Bath last March - who provided the necessary boost. Handed possession midway inside the Falcons half, it was Short’s turn to start making headlines.Little appeared to be on initially for the Exeter man, but in the blink of the eye he not only bamboozled the Newcastle defence, but he was racing clear of the cover to score a crucial second score. Skinner’s conversion attempt cannoned back off the left post, but the Chiefs had at least given themselves a fighting chance. Newcastle, though, were far from finished. Still in front and in control of proceedings, they threatened once more.Attacking down the right flank, they were doing their utmost to try and deliver the knockout blow. Instead, it was the Chiefs who provided the punch, Bodilly lapping up possession midway inside his own half. With little choice other than to pin back his ears and canter down the left touchline, the 24-year-old had just about enough in the energy bank to hold off the threat of Kibirgie, who was haring after him at a rate of knots. The visiting coaches punched the air in delight, but they knew their troops were still two points adrift on the scoreboard. With the conversion to come, Skinner duly stepped up to dispatch a sublime kick that dissected the posts. With the scores locked at 22-apiece, the dying embers of the contest resembled more of a chess match rather than a full-blooded rugby clash. Neither side were willing to give an inch, fighting for everything, yet not willing to push hard enough for fear of paying the penalty. The Falcons set up camp late on to forge a drop-goal opening for Connon, but his kick at the target was charged down by Sean Lonsdale, sparking a race down field that in turn put the visitors in full-on attack mode. Exeter huffed and puffed for a late winner, but it was not to be as they conceded a penalty that allowed the Falcons to clear.Newcastle then threatened again, but they too could not fathom an answer.In the end, it was honours even. However, both sides will reflect on what might have been. Chiefs: M Bodilly; T O'Flaherty (S Morley 71), T Hendrickson, S Hill, O Woodburn (J Short 51); H Skinner, S Maunder (J Snow 66); M Low (B Keast 51), E Taione (J Innard 51), G Holmes (capt, M Street 48); T Salmon (J Freeman h/t), W Van Der Sluys; J Caulfield, S Lonsdale, T Lawday (O Kaufusi 66).